Sending my best wishes for a the speedy recovery of Mr's Timely , stairs should come with a health warning. 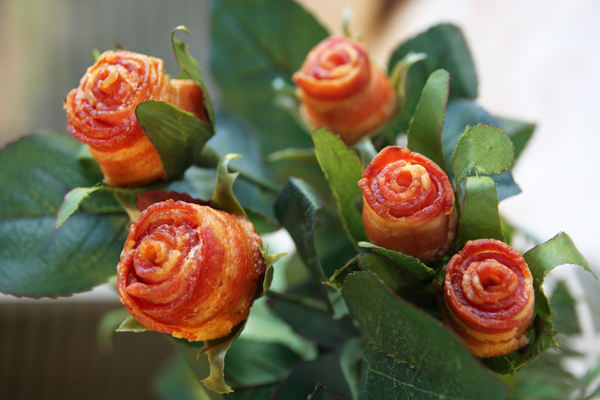 Give Mr's T these bacon roses mate , does the trick every time. Sorry for her injuries! Hope she mends with the best bedside help imaginable... you! Prayers and good vibes for the worst part to have passed by already! I sent a small silent prayer on behalf of your wife Timely. Sorry bud, I’m used to talking to you in Acronyms. Seriously though, what a terrible accident. I will be praying for you and your wife, and for the doctors to be be able to make wise decision to help in her recovery. Sending all my positive energy and good thoughts your way. Please keep us posted. Thank you ALL again for the wonderful support prayers and good wishes. There has been no changes overnight which I guess is a good thing. She is to have more scans done this morning which will give the Docs more information as to whether they need to relieve pressure on her brain. They can't distinguish whether it is the spinal injury which is in the thoracic area or the bleed causing her left side paralysis. Again, you are all a wonder and your words, thoughts and prayers mean so much to me at this time ! Thank you for the update and am keeping the prayers coming, Brother! !